Hunter absolutely LOVES the aquarium. She runs around like a crazy person trying to say any names she knows (she’s pretty sure the Caymans are ‘croc-oh-die-ahls’ all 4 syllables, and no arguments to the contrary would suffice), pointing at things to show Jones, while I and my stroller just try to keep up. She also enjoys a day of changing the fishtank water with daddy. They change the water, feed the fish, watch them swim. It’s a bonding activity. So you can see, fish are important to Hunter! 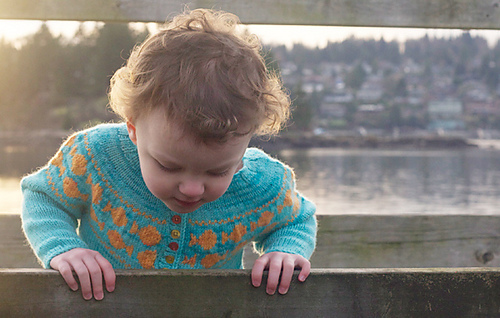 I had to knit her a fair isle yoked sweater to commemorate this fish-filled time of her life. 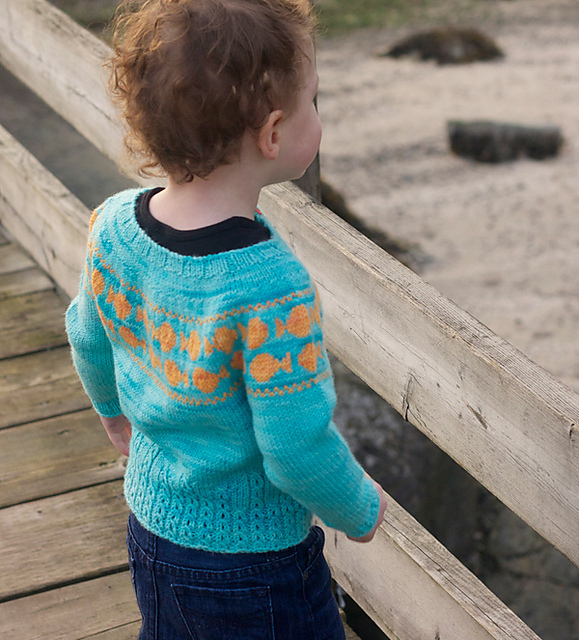 Goldfish is knit from the top down, sleeves and button bands are knit last. It has a cute little bubble detail at the bottom. I decided to throw caution to the wind and put a LOT of buttons on it because they are so darn cute! I just leave them buttoned and pull it over her head, she doesn’t mind much. For Goldfish you will need 2 colors of sport or dk weight yarn, something bright and vibrant for Spring! If you haven’t tried fair isle knitting yet, it’s time to learn! There are so many multi-colored wonderful patterns out there and so many great color combinations to choose from! If you are intimidated just give us a call and Amanda will set you straight, she’s a whiz with colorwork! This entry was posted on Friday, April 26th, 2013 at 11:23 pm	and is filed under Uncategorized. You can follow any responses to this entry through the RSS 2.0 feed. Both comments and pings are currently closed.